In the midst of turmoil in the Middle East, and in the face of protests and demonstrations from Homs to Damascus and other places all over Syria, the Ba’th Party and Bashar al-Asad are truly caught up in a struggle to hold onto power in Syria. 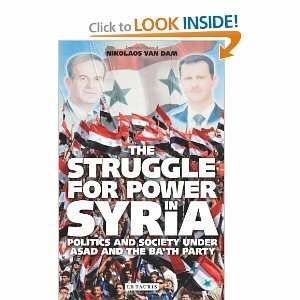 In this important book, Nikolaos van Dam explores and explains how the Asad dynasty has come to rule Syria for about half a century and keep the complex patchwork of minorities, factions and opponents securely under control for such an unprecedented long period. Through an in-depth examination of the role of sectarian, regional and tribal loyalties, van Dam traces developments within the Ba’th party and the military and civilian power elite from the 1963 Ba’thist takeover up to the present day. Nikolaos van Dam is a specialist on Syria and has served as Ambassador of the Netherlands to Indonesia, Germany, Turkey, Egypt and Iraq. هذه المقالة كُتبت ضمن التصنيف كتب. الوسوم: Nikolaos Van Dam. أضف الرابط الدائم إلى المفضّلة.